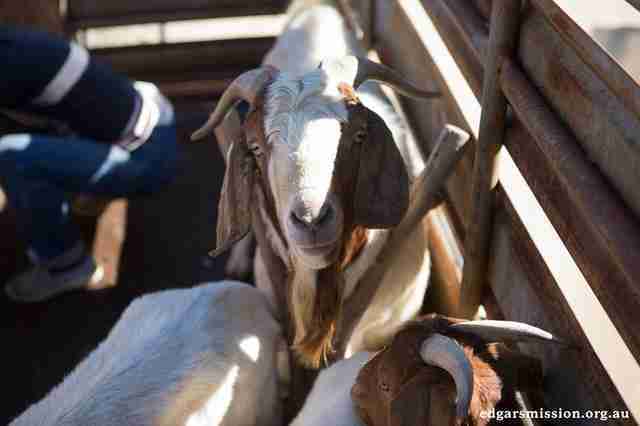 These goats had a literal burden lifted off their shoulders - and thanked their rescuers in the sweetest possible way. 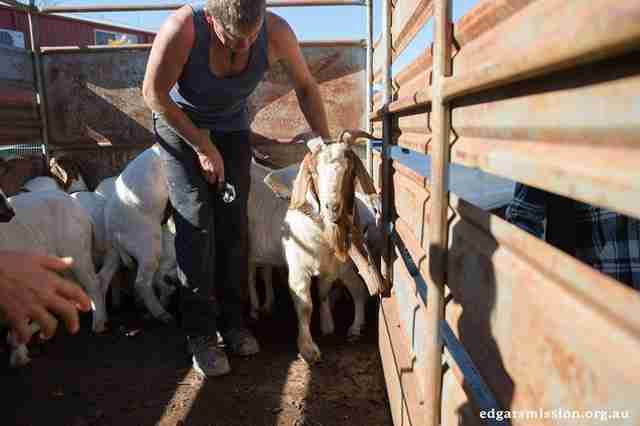 Australian rescue Edgar's Mission took in the herd of 16 Boer goats earlier this month. They were marked as former escape artists by the huge wooden yokes wired around their necks - a method Edgar's Mission founder Pam Ahern called "rather crude and cruel." 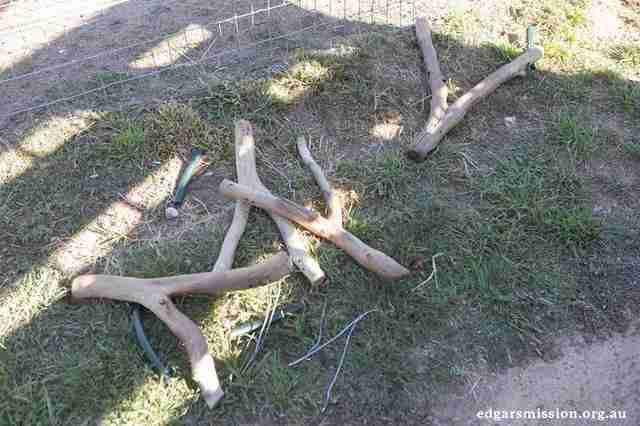 The yokes were designed to stop the goats from breaking through fences, though they apparently didn't work. 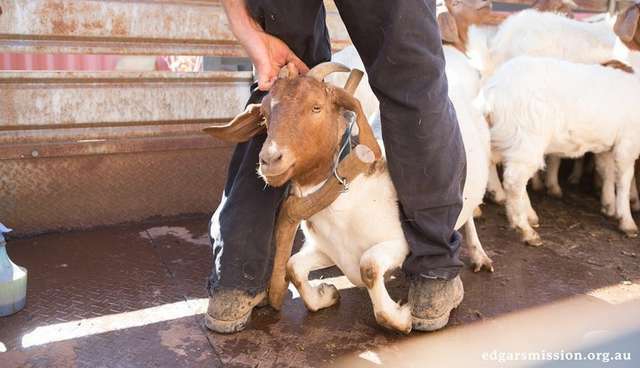 Edgar's Mission rescued the troublesome group from a rural pound, where they had been surrendered by their owner, just before they were sold for slaughter. 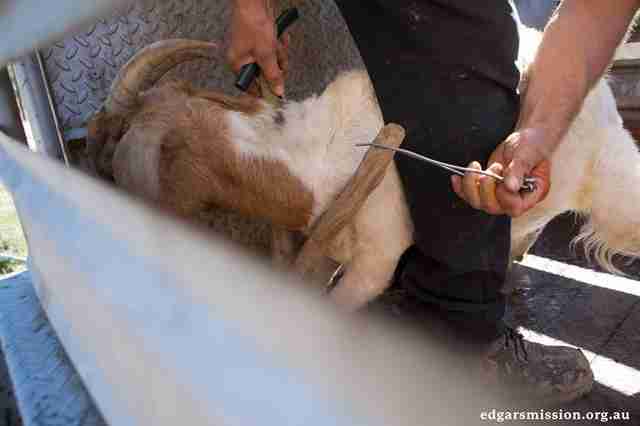 As soon as they arrived, rescuers set about removing the heavy, clunky collars from the poor goats' necks. "It took some time cutting the yokes off, with several of the poor fellows having terrible sores and abrasions where the [yokes] had rubbed their flesh," Ahern said. "The yokes had been on for such a long time the wood had worn all smooth for wearing against the animals' fur." "It was very emotional for all of us when they arrived as they were all clearly scared of humans due to lack of contact," Ahern explained. 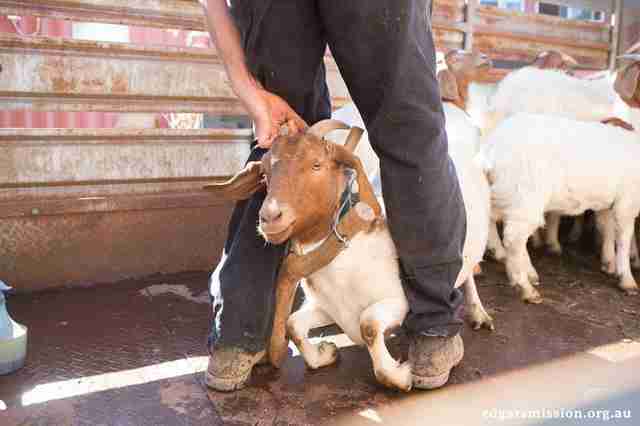 She added that Boer goats are normally one of the friendliest breeds and are quite talkative. With the yokes off, the goats seem visibly more relaxed. 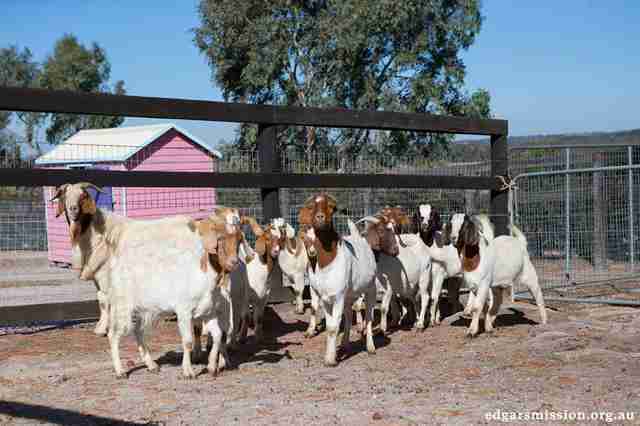 "All the goats have quickly settled in," Edgar's Mission wrote in a Facebook post. "They are proving curious, inquisitive and friendly." And, in the early morning hours of their first night at the sanctuary, one of the females provided her rescuers with the sweetest surprise. 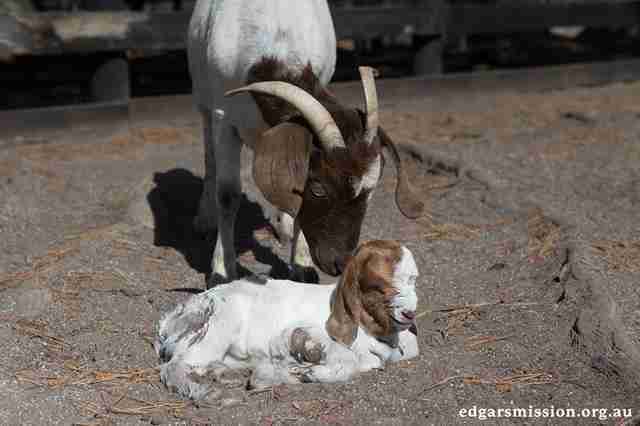 She gave birth to a little bundle they named Iliad, in honor of his father, who's named Homer. The lucky new arrival is sure to have everything his parents didn't: a safe home, loving carers and, hopefully, a happy and healthy life. A picture shows the new mother lovingly bent over the tiny bundle, who already looks like he has a smile on his face. Edgar's Mission is currently looking for someone to adopt the herd and provide them with a safe, loving home. If you live in Australia and would like to find out more about adoption, click here. To donate to their care click here.